The tiny modules are based on Liquid Crystal Polymer (LCP), a thermoplastic dielectric material with very low water absorption (< 0.04%), high chemical stability and low thermal expansion. LCP is best suited both as a substrate material and as an encapsulate. The permeability for water and gases is the lowest among all polymeric materials. Soak tests with an embedded, moisture sensitive test chip have demonstrated long term stability (> 14 months) and sufficient hermeticity for exposures in harsh environments. Processing techniques for LCP substrates are the same as for other substrate materials. 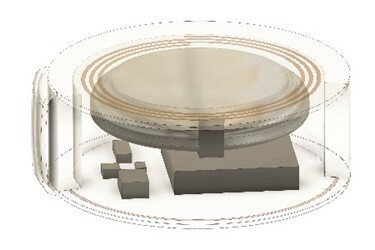 Resolution of lines, spaces and vias are comparable, multilayer structures can be built and part of the metal layers can be used to form a coil for NFC (Near Field Communication). The substrates can be assembled with standard SMT processes as well as connected and sealed without the need for any adhesives by benefiting from its thermoplastic properties. LCP is a homogenous material and can be easily machined with UV lasers with a precision down to the micrometer scale, for example to integrate cavities and openings for recessed components. For further information on the sensor modules please contact Dr. Eckardt Bihler, Business Development & Program Manager at DYCONEX. He will also hold a presentation on this subject at Smart Systems Integration 2019. With more than 50 years of experience, DYCONEX AG is an international leader in the supply of highly complex flexible, rigid-flex and rigid HDI/microvia circuit boards and chip-substrate solutions. These products are used in applications where miniaturization, increased functionality, quality and the highest level of reliability play a role. Headquartered in Bassersdorf, DYCONEX has 180 employees and the company is a member of the Micro Systems Technologies Group. The Micro Systems Technologies group consists of four high-tech companies that offer innovative components and services for high-tech industries that demand exceptional performance, quality and the highest levels of reliability such as med tech and aerospace.